Candidates appearing for MHT CET 2019 exam must prepare for it thoroughly from class 11th and 12th board syllabus of HSC Board of Maharashtra. The subjects covered in MHT CET 2019 exam are- Physics, Chemistry, Biology and Mathematics as stated by DTE (Directorate of Technical Education) Maharashtra. 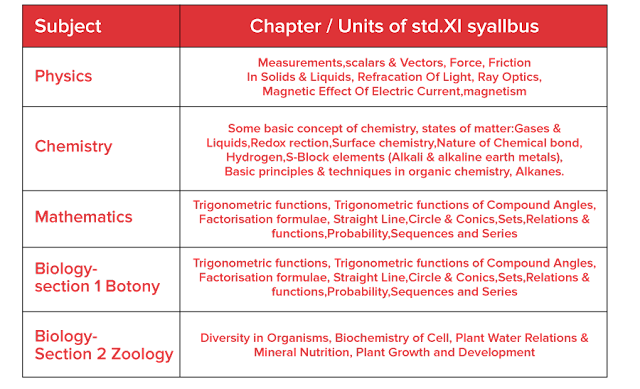 Understand the complete MHT CET Syllabus & clear each and every single concept from text books. Approximately 20% weightage will be given to std.XI curriculum and 80% weightage will be given to std XII curriculum while setting the question paper.